It's been raining a lot during this strange February. Here in the woods the coldest hours of the day bring some snow and wet snowflakes drench the earth. Chasing away the feeling of being damp to the bones is impossible, so we try to warm ourselves the best way we can: with a good cup of tea and a lot of wool, even when at home. 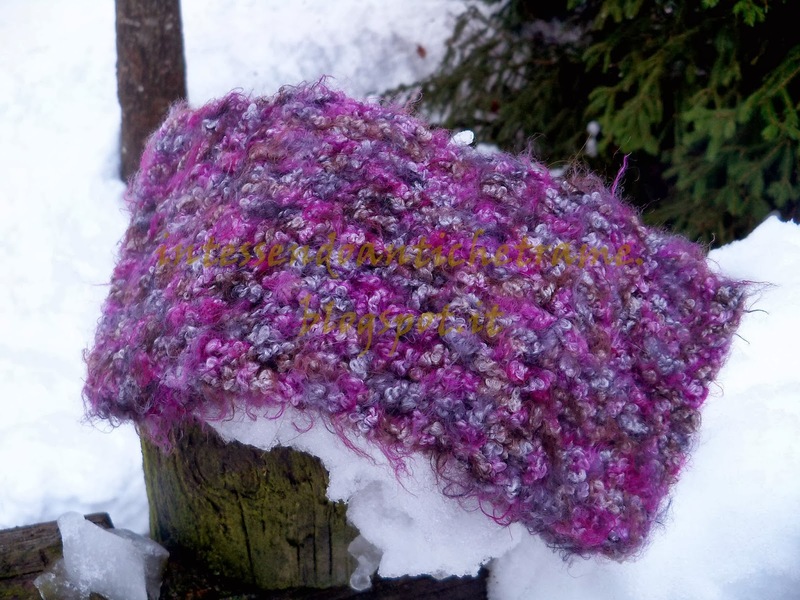 Given these circumstances I find neckwarmers to be really of use, so I've decided to show you another one (here's the first), recently made with just a 50 g bouclé chenille yarn. Needless to say it's the softest thing I've ever made, it's also very warm, which makes it even more lovely to wear. Colori molto caldi e belli. E' vero, anch'io speravo nell'arrivo della primavera ma credo che lo scaldacollo lo porteremo per parecchio tempo ancora, più per l'umidità che per il freddo. A presto. Bel colore il tuo morbido scalda collo e certamente molto caldo e confortevole...quel che ci vuole in questi giorni umidi!La neve,almeno,mette un po' di allegria.Qui oggi,incredibile ma vero,sole! Hi !!!! I am a new follower from Greece !!!! Your scarf is very beautiful and warm !!! !l Lovely colours !!!! !